In our millennial age, perhaps no other activity has captured the weekend imagination of young adults more so than the “bar crawl.” Hardly a month goes by without one’s calendar getting pummeled with invites to various holiday binge-drinking events, where one may be expected to dress as anything from Santa Claus to an Irish stereotype, all the while walking from bar to bar in one of the city’s many nightlife districts. It’s all fun, but lately I’ve grown tired of the obnoxious, drunken shenanigans, the over-priced drinks, and their subsequent hangovers. But not wanting to rid my life of the practice entirely, I’ve begun looking for other applications of the “crawl.” So this past weekend I woke up early and began the city’s first inaugural Midtown Coffee Crawl. What followed was a morning of manic energy, fleeting mental clarity, and existential dread. I should at this point warn everyone to never do this. I mean bar crawls are dangerous and all, but at least you can sleep off a day of over-drinking. First stop: Cornerstone Coffee House. It was still relatively early as I made my way through the doors at 54th and College. My vision was blurry and my mind foggy from the last remnants of sleep. Desperate for a boost of caffeine, I sidled up to the counter and began my adventure with something a little fancy: a Chai Tea Latte. Now I’m not one who normally indulges in such a decadent morning beverage. I usually stick to black coffee, but I was feeling a bit adventurous given the circumstances, and I was not disappointed. The sweet and spicy notes awoke the senses, and the warm creaminess was complemented by the coffee shop’s low lighting and cozy wood walls. I should mention that if you’re looking for the hair of the dog or maybe just a nice brunch to settle the stomach, don’t worry, Cornerstone Coffee Shop has a full menu and even a bar. Second Stop: Hubbard and Cravens. I finished my drink at Cornerstone, and made the long walk up to Broad Ripple. Hubbard and Cravens is a sleek and modern coffee shop on Carrollton just south of Broad Ripple Avenue. With it’s hip, chic vibe, H&C is kind of like a more upscale Starbucks. I got a black coffee and took a seat towards the back of the shop, soaking in the gentle, upbeat muzak. The coffee was slightly acidic with strong nutty notes. The shop was not very busy, with only a few patrons taking advantage of the free wifi. I could tell that the caffeine was beginning to kick-in as my hands and feet began to jitter and the photorealist paintings the coffee shop had adorned on its walls began to have an unsettling effect on my demeanor. Everything was just a little too quiet, so I topped off my drink and made my way. 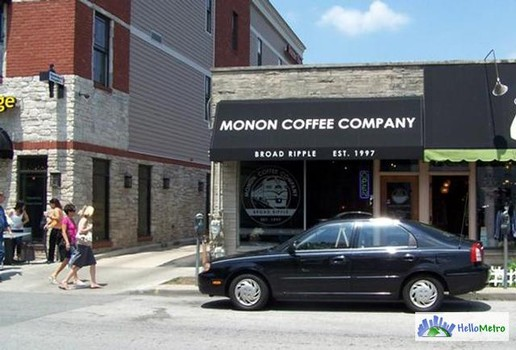 Fourth Stop: Monon Coffee Company. I was really hitting my stride as I walked in the coffee shop’s entrance on Westfield Boulevard. My racing mind was eased by the shop’s cozy ambience. The walls and shelves were adorned with local artwork for sale, and after I ordered my drink (a fair trade coffee fixed with skim milk and agave nectar) I took a seat on one of the shop’s well worn couches. The agave gave the coffee a light sweetness similar to that of honey, and I could really taste the, uh, fair trade-iness. I made a mental note to look up the difference between fair trade and free trade once I got home since I knew that despite their similar names there’s a pretty big difference between the two. No more alienating myself at parties by mistakenly championing the forces of free trade. Knowledge is power! Fifth Stop– Perk Up! It was in the wee hours of the afternoon that I found myself at the front counter of Perk Up! I knew I shouldn’t be getting another cup of coffee. I had already bombarded my synapses with enough caffeine to send a medium sized dog into cardiac arrest, but in my altered state of mind I was absolutely monomaniacal in my goal of completing my coffee crawl. So despite my better judgment I ordered an Organic Guatemala blend and fixed it up with raw sugar and cream, and found a seat on the patio. I was soaking in the sun, trying not to lose myself in a sudden fit of nerves, when I noticed that there were bees everywhere. I managed to finish my final coffee of the day without making any sudden movements and I congratulated myself on not launching myself into a caffeine induced state of nervous singularity. In my neurotic stupor I wandered my way back home and reflected on what I learned, which mostly was that drinking too much coffee is never a good idea. Your grammar this time is very good! “Neurotic stupor”appears to be an oxymoron but really works! Nice idea for your column too!